TAMPA, Fla. / WESTBOROUGH, Mass. (July 20, 2018) – SOLOS®, a unit of Kopin Corporation, together with IRONMAN, a Wanda Sports Holdings Company, is proud to announce that SOLOS has become the official Smart Glasses of IRONMAN North America and the IRONMAN World Championship. SOLOS’ new smart glasses will be showcased at the IRONMAN® World Championship and various other events in the United States and Canada throughout this year, starting at IRONMAN Lake Placid on July 22. SOLOS smart glasses allow triathletes, cyclists and runners, to receive critical performance information through sight and sound, which enables the athlete to focus on their performance and enjoy the training experience, avoiding unsafe distractions. SOLOS provides a more natural way of communicating data that is safer and more immediate, keeping athletes focused, present and fully aware during training. SOLOS smart glasses contain proprietary augmented reality display and noise cancellation technologies in light and fashionable sunglasses allowing the athlete to view metrics as if the data is floating in front of them and to receive other information through audio messages. SOLOS is the world’s lightest augmented reality smart glasses for sports performance, designed to inform and inspire while keeping athletes safe so that they can reach their full potential. Since the brand’s inception, SOLOS smart glasses have been dedicated to developing a seamless experience that brings together technology, sport and fashion, and has relied on direct feedback from athletes, like 11-time IRONMAN 70.3® Champion, Sam Appleton, to make the best smart performance glasses on the market. In addition to features to improve performance, SOLOS smart glasses also offer design and lifestyle elements that increase the joy of any running experience, including integrated music, group communication, phone calls, interchangeable lenses and an adjustable nose piece for added customization, among others. They are compatible with iOS and Android smartphones and Android Wear 2.0 smartwatches. SOLOS smart glasses are available now at www.solos-wearables.com. For more information, follow SOLOS on Twitter or the Facebook page. SOLOS® smart glasses are the world’s most technologically advanced smart glasses. Leveraging decades of Kopin’s experience in heads-up displays and other technologies, SOLOS smart glasses inform and inspire athletes to reach their full athletic potential. 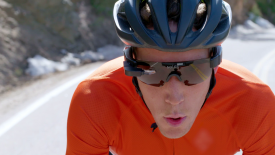 Built for cyclists, runners and triathletes, SOLOS smart glasses deliver critical information to the athlete in a seamless, integrated fashion through sight and sound. SOLOS smart glasses provide a more natural way of communicating that’s safer and immediate, keeping the athlete focused, present and more fully aware. Smart Communication. Ultimate Performance. Learn more at www.solos-wearables.com. Kopin Corporation is a leading developer of innovative wearable computing technologies and solutions. Kopin’s technology portfolio includes ultra-small transmissive, reflective and emissive displays, optics, speech enhancement technology, software, low-power ASICs, and ergonomically designed smart headset concept systems. Kopin’s proprietary components and technology are protected by more than 300 global patents and patents pending. For more information, please visit Kopin’s website at www.kopin.com. A Wanda Sports Holdings company, IRONMAN operates a global portfolio of events that includes the IRONMAN® Triathlon Series, the IRONMAN® 70.3® Triathlon Series, 5150™ Triathlon Series, the Rock n’ Roll Marathon Series®, Iron Girl®, IRONKIDS®, International Triathlon Union World Triathlon Series races, road cycling events including the UCI Velothon® Series, mountain bike races including the Absa Cape Epic®, premier marathons including the Standard Chartered Singapore Marathon, and other multisport races. IRONMAN’s events, together with all other Wanda Sports Holdings events, provide more than a million participants annually the benefits of endurance sports through the company’s vast offerings. The iconic IRONMAN® Series of events is the largest participation sports platform in the world. Since the inception of the IRONMAN® brand in 1978, athletes have proven that ANYTHING IS POSSIBLE® by crossing finish lines at the world’s most challenging endurance races. Beginning as a single race, IRONMAN has grown to become a global sensation with more than 230 events across 53 countries. For more information, visit www.ironman.com. SOLOS and Kopin are registered trademarks of Kopin Corporation. All other company names or product names are the trademarks of their respective owners. Statements in this press release may be considered “forward-looking” statements under the “Safe Harbor” provisions of the Private Securities Litigation Reform Act of 1995. These include, without limitation, statements relating to SOLOS has become the official Smart Glasses of IRONMAN North America and the IRONMAN World Championship and SOLOS’ new smart glasses will be showcased at the IRONMAN® World Championship and various other events in the United States and Canada throughout this year. These statements involve a number of risks and uncertainties that could cause actual results to differ materially from those expressed in the forward-looking statements. These risks and uncertainties include, but are not limited to, the agreement that SOLOS is the official Smart Glasses of IRONMAN North America and the IRONMAN World Championship may be terminated; SOLOS new smart glasses may not be showcased at the IRONMAN® World Championship and various other events in the United States and Canada throughout this year because the events may be postponed or not be held; Kopin may decide not to show SOLOS at the events; the relationship between SOLOS and IRONMAN may be terminated; and other risk factors and cautionary statements listed in Kopin’s periodic reports and registration statements filed with the Securities and Exchange Commission, including the Annual Report on Form 10-K for the 12 months ended December 31, 2017, and Kopin’s subsequent filings with the Securities and Exchange Commission. You should not place undue reliance on any forward-looking statements, which are based only on information currently available to Kopin and only as of the date on which they are made. We undertake no obligation to update any of these forward-looking statements to reflect events or circumstances occurring after the date of this release.